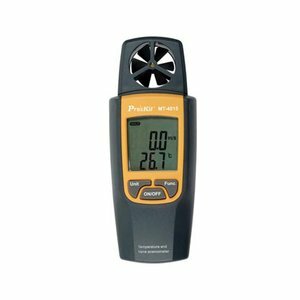 An anemometer is a device for measurement of the speed or velocity of gases either in a contained flow, such as airflow in a duct, or in unconfined flows, such as atmospheric wind. 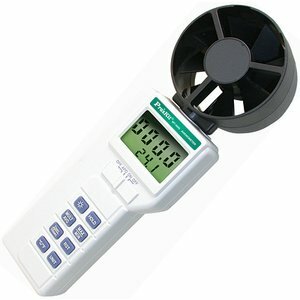 This vane anemometer measures wind speed, airflow (CFM and CMM) and temperature of mainframe and transducer. Airflow measurements in heating, ventilation, and air conditioning systems, air duct analysis, monitoring or process air. 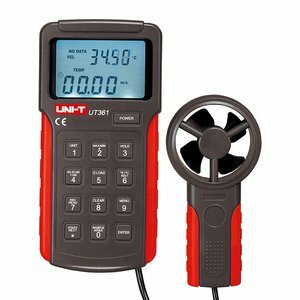 Multimeter for temperature (ºC and ºF ) and velocity (m/s, km/h and fpm, mph, kts, Beaufort scale) measurements.